University Presbyterian Church is seeking its next Head of Staff or Clergy Couple who will inspire and encourage us in our faith! Selection of our next Pastor/Head of Staff is of major importance to the future of UPC. To carry out this process, the congregation elected us to serve as the nine-member Pastor Nominating Committee (PNC) at the Congregational Meeting on Sunday, July 22, 2018. We are filled with a sense of humility and gratitude for your entrusting us to serve UPC and the larger Church in this way. We are working to select and place in nomination to the congregation a candidate for the installed Pastor/Head of Staff of UPC. During our training, we were reminded of the ancient wisdom of Isaiah 43:19. In the coming months – before the arrival of our next Pastor/Head of Staff – our committed program and administrative staff will remain in place, our faithful Session will continue to lead us in ministry, and our congregation will continue to be the church together. We are confident that God will provide a way through this time of wilderness even as a new season in UPC’s life commences before our eyes! Note – sections with recently updated information are noted in bold and with an asterisk (*). The last updates were made on April 12, 2019. What is the latest from the Pastor Nominating Committee? To this point in early March, we have reviewed the applications of over 90 pastors. We described the process that we’re using in the February edition of The Chimes and Patty Haydon provided an update at our Congregational Meeting on Sunday, February 24. You may find the text of those reports by clicking on the Prior Updates tab above. After period of deep discussion and prayerful discernment, our evaluation process enabled us to prioritize a select number of pastors for further conversation. We’ve already had wonderfully enthusiastic and informative video teleconferences with pastors who have developed amazing ministries and spiritual programs — and we have a strong sense that each of the individuals has the gifts needed to lead and serve with University Church. We are continuing our conversations with high-priority candidates. We will soon begin the process of meeting our leading candidates for face-to-face conversations. These conversations will be the focus of our efforts for much of March. Even though we are moving into a phase along the journey where we must keep the confidences of those we are considering, we are happy and excited to share other specifics with you about our work and we invite you to engage with us. We encourage you to contact the committee via email (pnc@upcch.org) or to start up a conversation with any PNC member! Who is serving on the Pastor Nominating Committee? (Our ninth member represents UPC’s youth and we have omitted this youth member’s information.) You are welcome to contact any individual on the team, or send a single email to the entire team. According to UPC’s call for nominations: Service on the PNC will require an enormous commitment of both time and energy. Members of the PNC should expect to meet as frequently as once a week for the duration of the search process, which could last for a year or more. Members of this committee must be prepared and willing to work as a team, putting congregational needs above personal preferences. Members of the PNC must honor the confidentiality of the search process. introducing the candidate to the congregation. The PNC began its work on August 29, 2018, and continues to meet for 2–3 hours each week The work of the PNC will end with the installation of the new pastor. What is a Ministry Information Form (MIF)? We were charged and trained by Ted Churn, Executive Presbyter of the Presbytery of New Hope, on August 29, 2018. Following that training, one of our first tasks was to develop a concise description of UPC’s vision of ministry and hopes for its next Pastor/Head of Staff. 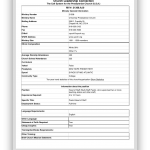 This document is our Ministry Information Form, or MIF. During the first half of this year, UPC was led by our Mission Study Team through the process of mission study that allowed us to consider who we are, who God is calling us to be, and what we’ll need in our next season of leadership from a new pastor. We drew from the resultant Mission Study Report to produce our MIF. Our MIF was approved by the session on October 18, 2018, and then by the presbytery’s Commission on Ministry on October 22, 2018. Please reach out to pnc@upcch.org with any questions. And if you’re interested in serving alongside a vibrant congregation and talented staff in the heart of Chapel Hill, NC, we’d love to hear from you! The MST shared your responses with us. The combination of our mission study work, our MIF, a formalized selection process, and specific candidate criteria will enable us to reach a deep, honest, and mutual sense of call with a new head of staff when the time is right. In November, we began to receive Pastor Information Forms (PIFs) from potential candidates. PIFs will continue to arrive through various channels, including self-referral, through PC(USA)’s computerized matching system, and by request as we reach out to potential candidates suggested by you or by other respected members of the larger Church. Please reach out to pnc@upcch.org with any suggestions – whether they be specific names or broader ideas. And if you’re interested in serving alongside a vibrant congregation and talented staff in the heart of Chapel Hill, NC, we’d love to hear from you! Our working plan is to solicit, review, and evaluate PIFs through the end of the 2018 calendar year. We will then begin the deeper process of discernment in early January and hope to begin substantive conversations with potential candidates no later than mid-February. While much of our work will seem quiet due to the strict confidential nature of a search, we are committed to offering updates as we are able. To help with this, there is a large timeline in the church office that will visibly track our progress through these activities and milestones. We invite you to visit as you are able! Though we are entrusted to keep the confidences of those whom we are considering, we want the congregation to be well informed, and we invite you to engage with us. We are happy and excited to share specifics with you about our work, and we want you to know that there is a unanimous sense among the PNC that the process is going well. After reading background information, listening to many sermons, and engaging in teleconferences, we are beginning to focus our attention on a handful of candidates. We have a strong sense that each of these pastors has the gifts and experiences needed to lead and serve with University Church. We are at the point in our process where delegations from the committee are beginning to attend worship services in those candidates’ home churches. In the weeks to come, we will be inviting top candidates for extended face-to-face interviews with the whole committee. If the way be made clear, we hope to request that our session call a congregational meeting to elect our new pastor before the end of the school year. If all goes well, then our new head of staff could join us before the beginning of our program year in September. It’s important to emphasize that our timeline is highly elastic and that we’re quite pre- pared to shift it as needed. Our focus is on calling the right pastor for UPC rather than fulfilling an idealized timeline. We welcome your prayers as we continue in this exciting and important work. We encourage you to contact the committee via email (pnc@upcch.org) or to start up a conversation with any PNC member! The sense that the work is going well is unanimous among the PNC members! It is important to remember that the Presbyterian way is one of discerning a mutual sense of call. Therefore, we have to keep in our hearts and minds that these amazing pastors with whom we’ve entered into a process of conversation and mutual discernment may not feel the Spirit’s call to leave their current ministries and congregations to join us. With that caveat in mind, we’ve read over 90 applications. You may be interested to know that around 20% of our applicants are female and 5% are clergy couples. Geographically, most of our applicants are from the southeast or mid-Atlantic, but we’ve had international applications as well as applications from as far as Florida, Michigan, Texas, and California among other states. From those applications, we selected candidates for deeper consideration. Our next phase of evaluation includes further reading of the candidates’ published or posted writings and listening to or watching more sermons available online. The evaluation seeks to put each candidate’s strengths and opportunities for growth in the specific context of our customs, needs, and expectations here at UPC. Our evaluation process enabled us to prioritize applications for further conversation. We’ve already had wonderfully enthusiastic and informative video teleconferences with pastors who have developed amazing ministries and spiritual programs — and we have a strong sense that each of the individuals has the gifts needed to lead and serve with University Church. We are continuing our conversations with high-priority candidates. And, we will be beginning the process of meeting our leading candidates for face-to-face conversations. Although there is much yet to be done, we are have been blessed by the bountiful evidence of God’s provision for our church. If the way be made clear, we hope to request that our session call a congregational meeting to elect our new pastor before the end of the school year. If all goes well, then our new head of staff could join us before the beginning of our program year in September. It’s important to emphasize that our timeline is highly elastic and that we’re quite prepared to shift it as needed. Our focus is on calling the right pastor for UPC rather than fulfilling an idealized timeline. The PNC welcomes your prayers as we move into deeper conversation with potential candidates. Watch our weekly E-news and worship bulletin insert for weekly reflections from PNC members. Even though we are moving into a phase along the journey where we must keep the confidences of those we are considering, we are happy and excited to share other specifics with you about our work and we invite you to engage with us! “When I was called to serve on your Pastor Nominating Committee (PNC) I was both humbly honored and terribly nervous. I was excited to serve the church using a skill set I use regularly in my career, but I also walked into this eyes-wide-open: this is a tall order and, frankly, I feel the pressure. 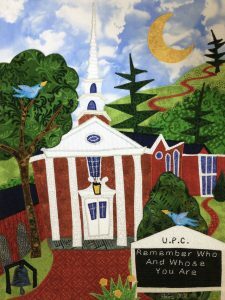 University Presbyterian Church has been my home for nearly 10 years and became a part of my life when I needed it most. This congregation is wonderfully unique and is made up of some of the most impressive yet down-to-earth people I have ever met. I have formed life-long friendships through the Young Adults group, have served the church through committees, have seen the church’s future in the eyes of the PCM students I have mentored, and got married here last summer. This community has challenged me and my faith in ways I didn’t think possible, but has also supported me so graciously on that journey. UPC feels like home. I can never repay this church for the ways it has changed my life–the ways you have changed my life. And so, I want to do right by every one of you as we do this work. We bring you greetings in the name Jesus Christ from your Pastor Nominating Committee (PNC). We continue our entrusted work to select and place in nomination to the congregation a candidate for the installed Pastor/Head of Staff of UPC. We are excited to share this update with you on the progress that we’ve made and our road map for the coming months. We hope this will answer some questions you may have about exactly how we work – and that it might convey our deep sense of hope and optimism around the process! During the fall, our first task was to use UPC’s Mission Study Report to develop a concise description of UPC’s vision of ministry and hopes for our next Pastor/Head of Staff. 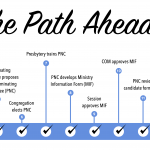 The resulting Ministry Information Form (MIF) was approved by session and the Commission on Ministry for the Presbytery of New Hope, and was posted on the PC(USA)’s Church Leadership Connection online system (CLC), where it is accessible to any interested pastors. In addition to making our MIF accessible, the CLC also allows an algorithm-based matching service to connect PNCs with pastors who are actively seeking or open to a call and have entered their information into the CLC. To date, our MIF has received well over 500 online views using CLC. 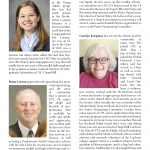 At the same time, both UPC and presbytery staff members have spread the word and shared some recommendations with us. UPC’s website and social media outlets also had news of our pastor search process and a link to our MIF. We recognized that we are likely looking for a pastor who isn’t actively seeking a new call, but might respond to a nudge from the Holy Spirit. Thus, we’ve collected suggestions of prospective pastors from our staff and congregation, and we also gathered guidance on leading pastors, presbyters, seminary presidents, church thought leaders, and other respected members of the larger Church who might suggest prospective candidates. Based on that guidance, we contacted 15 senior individuals who commended a number of additional pastors to us for further conversation. As our MIF circulated and garnered attention, we developed specific candidate criteria and a detailed process to use in selecting our next pastor. The Mission Study Team previously reached out to the congregation to ask for opinions as to the experiences and qualities sought in our next pastor. We are grateful for the time and effort you made in providing 278 individual written responses. Our multi-stage application review process has been laborious but thorough, and we are hopeful that our efforts will enable us to reach a deep, honest, and mutual sense of call with a new head of staff. Through mid-January, we have already reviewed the applications of more than 80 pastors. Each PNC member independently reviewed applications based on her or his personal evaluation of how well the application met our specific candidate criteria. During the ensuing committee meetings, the applications were thoroughly discussed. As we read and discussed, we prayed continuously for God’s guidance, referring frequently to our MIF, while considering a number of distinctive qualifications and prior experiences. As we write this, we have over a dozen applications who have received our highest “grades” as their apparent strengths and opportunities for growth best match UPC’s customs, needs, and expectations. As we progress through winter, we will continue reviewing applications and we will begin to conduct interviews with prioritized candidates by video teleconference. During early spring, we hope to visit face-to-face with the most outstanding candidates in their home churches. Finally, we will host a select few candidates in Chapel Hill to tour our church and community, share meals with all members of the PNC, and engage in various activities of particular interest to the candidates. Once we have reached a mutual decision with a preferred candidate, we will notify presbytery and, when the call has been approved, we will ask our session to call a congregational meeting to elect the new pastor. If the way be made clear, we hope to deliver this request by late spring. Although we know that there is much more important work to be done, we are confident that it is going well. You elected a committee with diverse talents who are selflessly sharing their gifts with the team as we go through this period of discernment. We are so grateful for Brian Curran, Carolyn Karpinos, Mary Ellen Olson, Karen Vandersea, Hank Waters, Bill Whisenant, and Eleanor Wilson! With this group, each meeting is filled with laughter, support for one another, trust in God’s leading, and much hope. We have already reviewed some truly amazing applicants who have developed awe-inspiring ministries in their current work and who feel called to lead a congregation like ours. Truly, these are exciting times! We ask for your continued prayers of support for faithful service, wise judgement, and shared discernment. We also ask you to honor our strict practice of confidentiality. As we proceed, we will continue to update the large timeline in the church office as well as our web page (upcch.org/pnc). We encourage you to share any questions or suggestions with us via email (pnc@upcch.org) or conversation with any PNC member. We bring you greetings in the name Jesus Christ from your Pastor Nominating Committee. We are filled with a sense of humility and gratitude for your entrusting us to serve UPC and the larger Church in this way. We have been trained by Ted Churn, Executive Presbyter of the Presbytery of New Hope, and met together for an additional four hours to come together as a team. During our training, Ted reminded us of the ancient wisdom of Isaiah 43:19. We are confident that God will provide a way through this time of wilderness even as a new season in UPC’s life commences before our eyes. The PNC will continue meeting weekly. We are drawing on your words and the report to develop a description of UPC’s vision of ministry and hopes for its next Pastor/Head of Staff for our Ministry Information Form (MIF). Once our MIF has been approved by the session and the presbytery’s Commission on Ministry, it will be posted online and circulated nationwide. We will receive Personal Information Forms (PIFs) from potential candidates through various channels, including self-referral, through PC(USA)’s computerized matching system, and by request as we reach out to potential candidates suggested by you or by other respected members of the larger Church. While this work will be less visible due to the strict confidential nature of a search, we are committed to offering updates as we are able. To help with this, there is a large timeline in the church office that will visibly track our progress through these activities and milestones. We invite you to visit as you are able! We welcome you to share thoughts or suggestions with us and to honor our practice of confidentiality. Above all, we ask for your prayers of support for faithful service, wise judgement and shared discernment.